We charities and foundations are the gatekeepers of our communities. Formed for the public good, and operated not for profit but for the public good. It seems however that most well meaning ideas take on a life of their own and after a time, many organizations will do anything to get money in the door. 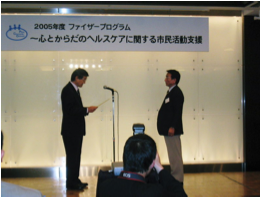 Pictured above is the chairman of Foodbank Kansai receiving money from Pfizer corporation. Pfizer is the largest drug manufacturer in the world, and they operate outside the bounds of national and international laws at their whim*. They routinelypay huge fines*to quietly make their discretions go away….They have run afoul of the laws of just about every country on the planet*. To receive money from a company that runs illegal drug tests in 3rd world countries at the cost of innocent lives is a crime against humanity and stains the receiving organization with the same blood. A bribe is a bribe and that money was nothing more than money given to bribe us all in to overlooking Pfizers horrendous transgressions. Charities have a unique responsibility in our societies. A responsibility to hold a higher moral standard. And as such a responsibility to choose their alliances appropriately. Not to choose alliances to line their pockets with no thought about where the money comes from. It must be a unwavering standard that we accept no money from a source that profits with no regard for human life and our fragile environment. As a charity, foundation, or support group for the weak or less fortunate, we should never take the position of an advertiser. Who would stand by to see advertisements for tobacco or casinos on the pulpit of the church or the prayer room of the temple? How about a banner on the website that says "proudly supported by the taliban or aum shinrikyo"….It would never be tolerated. One must accept the responsibility of the position they accept and not try to walk both sides of the track. Is it easy to fund works of good without taking money from companies that only seek to validate themselves and cover their sins? No, it is not easy at all, but that is the responsibility that one takes on when they put on those robes. It is time for us to be honest, to stand against evil and expose it for exactly what it is. corporate social responsibility starts with doing business ethically in all areas. sources must never actuarialize human life when considering business decisions. sources must not seek out areas of low average wages and lax regulations in order to maximize costs and pay their workers in parity regardless of location. sources must not engage in the production of products or promote services that are detrimental to the social fabric. donations will only be accepted under the condition of anonymity. Kozmoz will refuse any donations from any company, group or individual found to operate outside those guidelines. As a course of policy, Kozmoz will continue to endeavor to be autonomous and self funded thru educational and socially positive enterprises. ↑  McNeil, Donald. "Medicine Merchants", New York Times, July 9, 2000. ↑ Pfizer Key Executives, Yahoo Finance, accessed August 2007. ↑ Board of Directors, Pfizer, accessed August 2007. ↑ Holly Bailey, "Prescription Drugs: A Look at Contributions from Pfizer & Pharmacia", Open Secrets, July 18, 2002. ↑ Pfizer Inc lobbying expenses, Open Secrets. ↑  Crossette, Barbara, "AIDS Fungus Drug Offered to Poor Nations", New York Times, June 7, 2001. "Pfizer pulls COX-2 DTC", Pharmaceutical Marketing, December 21, 2004. FDA Was Told of Viagra-Blindness Link Months Ago]", Washington Post, July 1, 2005. Marc Kaufman, "FDA Was Told of Viagra-Blindness Link Months Ago: Senator Criticizes Delay in Alerting Consumers After Safety Officer Warned Agency About Drug", Washington Post, July 1, 2005. Beth Herskovits, "Pfizer's Spectrum Science encourages health policy debate," PR Week (sub req'd), January 11, 2006. Rick Weiss, "'Serious Misconduct' by NIH Expert Found: Scientist Did Not Report Sending Tissues to Drug Firm and Getting Paid, Report Says," Washington Post, June 14, 2006. Ted McKenna, "Public affairs is Pfizer focus," PR Week, August 23, 2006. Alex Berenson, "End of Drug Trial Is a Big Loss For Pfizer and Heart Patients", New York Times, December 6, 2006. (Article explianing corporate impact of end of Torcepapib trials). Matthew Dolan, "Scientist pleads guilty: NIH official made illicit deal with drug company", Baltimore Sun, December 9, 2006. Peter Rost, M.D. (former Vice President of Pfizer), "The Whistleblower, Confessions of a Healthcare Hitman", Soft Skull Press (September 10, 2006). Stephanie Saul, "Celebrex Commercial, Long and Unconventional, Draws Criticism," New York Times, April 10, 2007. "US lawmakers probe endorsements," PM (Pharmaceutical Marketing) Live, January 9, 2008.